designed to get you workforce ready. Our work-based learning (WBL) program provides students with opportunities to link their career technical training with practical, on-the-job activities. Students participating in WBL improve their work habits and attitudes, identification of goals and aptitudes, and the motivation to complete and further their education. Click on a career to explore the details and requirements, or filter by career area. HVAC professionals make buildings cool in the summer and warm in the winter. They control temperature, humidity and use a wide array tools to keep systems working optimally. 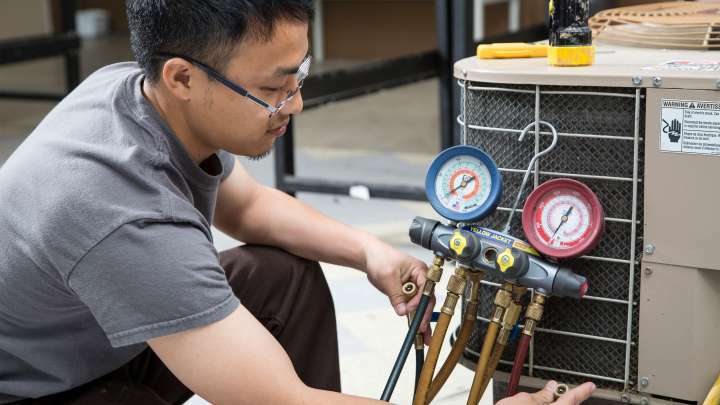 *Heating, Ventilation, and Air Conditioning (HVAC) is a Pre-Apprenticeship program, which offers students the hands-on training and education needed to qualify for apprenticeships. Guard, patrol, detect, deter, observe, report, protect, and monitor premises, to prevent theft, violence, or infractions of rules. Keep in mind that details will vary depending on your specific background, goals, and interests. A Job Corps recruiter can help you get all the answers you need.